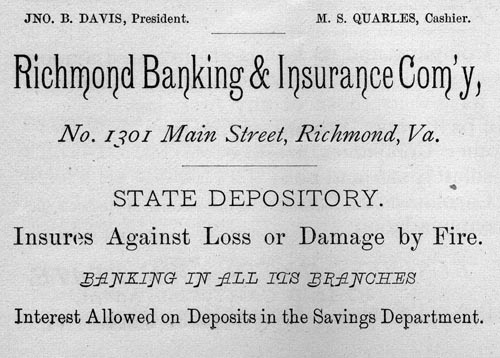 Richmond Banking & Insurance Com'y, No. 1301 Main Street, Richmond, Va.
STATE DEPOSITORY. Insures Against Loss or Damage by Fire. BANKING IN ALL ITS BRANCHES. Interest Allowed on Deposits in the Savings Department. JNO. B. Davis, President. M. S. QUARLES, Cashier. 1. The Insurance Advocate, Vol. IX, No. 3, Richmond, VA., March, 1878, page 56.